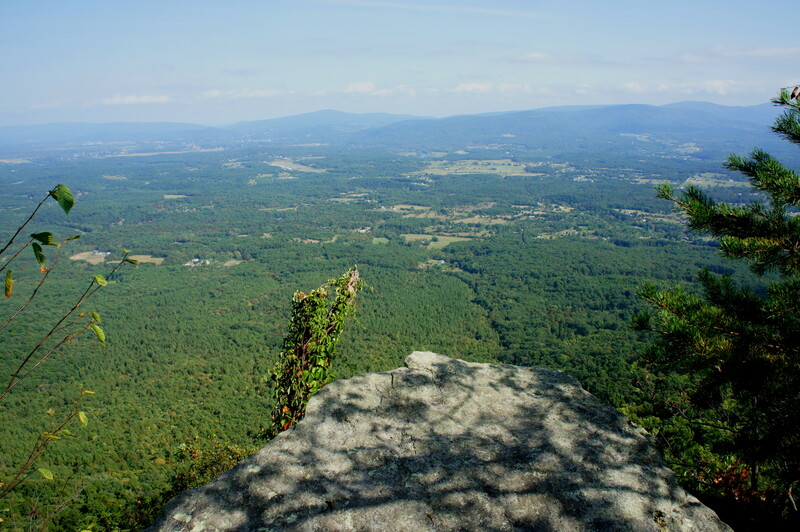 Buzzard Rock, situated at the northeast corner of Virginia’s Massanutten Mountain, is not a singular monolith as the name implies. Rather, it is a razor-toothed spine of sandstone more than a quarter mile long, perched high above Fort Valley and Passage Creek. While it lacks the heights of the nearby Signal Knob Loop, this 4.5-mile one-way trek to Buzzard Rock from the Elizabeth Furnace area is—in my opinion—a far better hike. 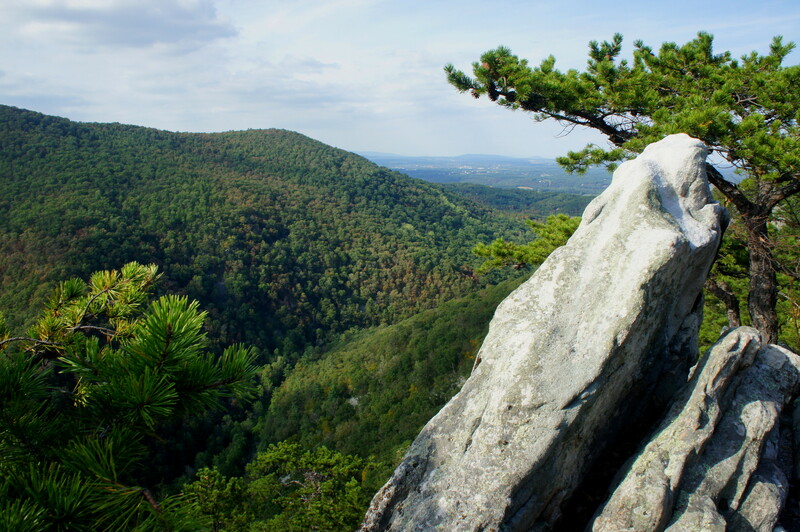 In addition to the worthy destination, the strenuous walk features a paradise of stony jumbles, terrific views east over Shenandoah Valley, and a touch of human history thrown in for good measure. 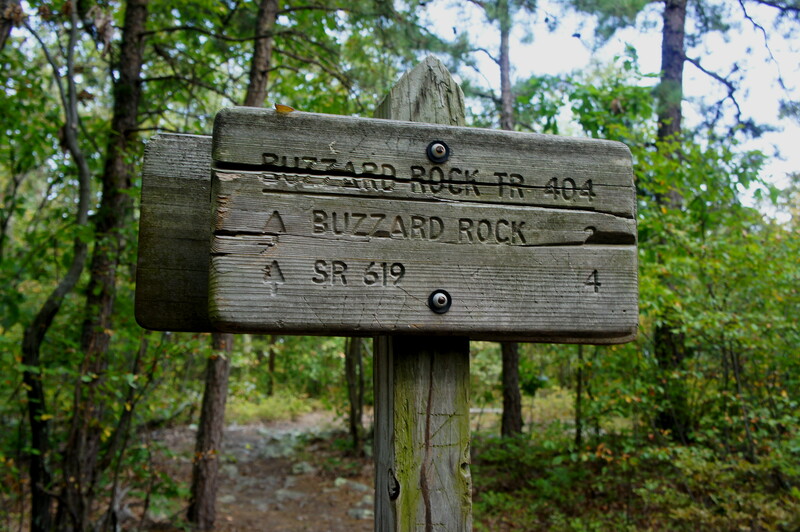 Most hikers approach Buzzard Rock from the northern end of the Buzzard Rock Trail, which starts from Mountain Rd./VA 619, south of Fort Valley Road. From here, it is a mere two miles to the rocks, though with a sharp 650-foot climb. The below description, however, covers an alternative route that is more strenuous and more than twice as long but unquestionably more scenic if you throw in a couple short detours along the way. 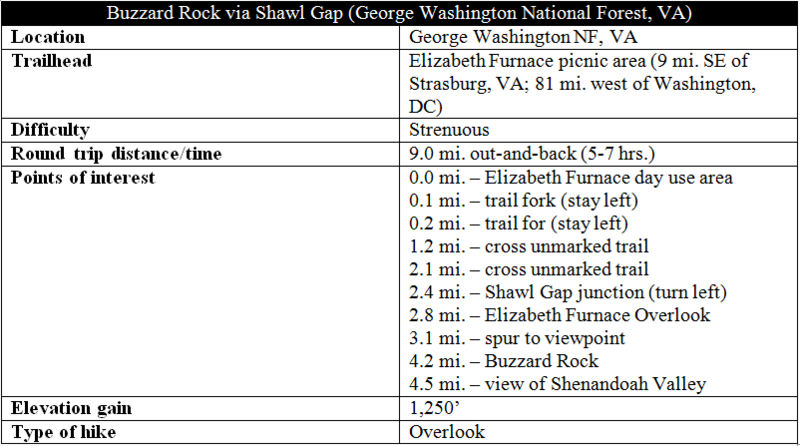 This hike begins at the Elizabeth Furnace Day-Use Area, situated around four miles down Fort Valley Road from VA 55, which provides access to Strasburg, Virginia and Interstate 66. Turn left at the sign for the picnic/day-use area, cross the small bridge over Passage Creek, and park in the large parking lot. Confusion reigns at the parking area, as a bevy of trails veers off in different directions. At the end of the parking lot (farthest from the entrance), a wooden boardwalk heads off to the southwest, while a white-blazed trail—not to be confused with the white-blazed Buzzard Rock Trail—heads southeast. Midway down the parking area on the left, a wide and grassy “interpretive trail” heads east. (Note: This provides access to the short Pig Iron Trail and Charcoal Trail.) The shortest route to Shawl Gap and Buzzard Rock, however, leaves from the northeast corner of the parking area, next to the restrooms. The unmarked path quickly gives way to a trail fork and a sign marked “Furnace Trails.” Bear left, heading toward the historic Elizabeth Furnace on the Pig Iron Trail, a self-guided path with regular informational waysides that provide greater context on the ecology and history of the area. At around 0.15 miles, Passage Creek appears on the left as the trail climbs gradually. 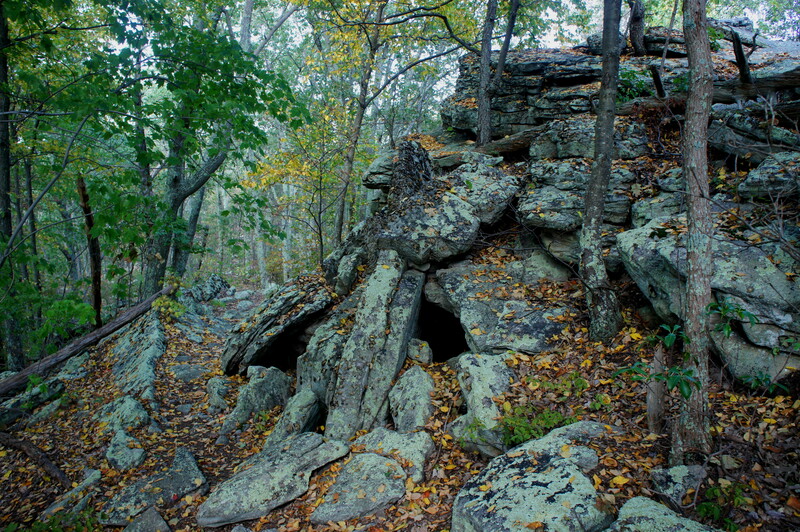 Seconds later, Elizabeth Furnace, a giant oven reinforced by stone, appears on the right; stay left at the next trail fork, following the blue and orange blazes as the path leaves the Pig Iron Trail. By now you are on a path jointly blazed by the Massanutten Trail, a 71-mile circuit around much of Massanutten, and the Tuscarora Trail, which spans four states over the course of 252 miles. For the next 300 yards, the trail hugs the banks of Passage Creek then rounds a right-hand bend that leaves the stream behind. 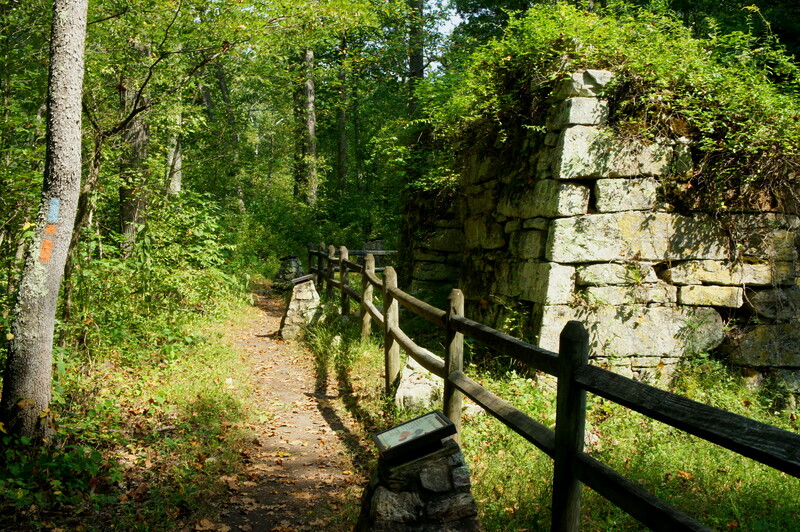 At 4/10 mile, the path crosses a wooden bridge over a minor ravine laced with boulders. Steps later, look for a stone pile on the left—more remnants of old settlements—as the trail climbs gently, then double back over the same ravine at around ½ mile. Just beyond, the trail settles into a southward course and begins to climb more steadily. At around 0.65 miles, a series of long and gentle switchbacks ensues. At 8/10 mile, at the end of a long straightaway, the trail cuts left. (Note: An unmarked path—which we will revisit later—heads right from here.) There are some limited views through the trees as the hike continues upward, but the best, unobstructed vistas will have to wait for a couple more miles. At around the one-mile mark, the trail makes straight for the mountain as it hugs the right flank of a shady gully. Rockier and steeper than before, the Massanutten/Tuscarora path approaches the edge of a massive boulder slide at 1.1 miles then hangs a right. Minutes later, the trail crosses an unmarked path—the same found earlier at mile 0.8—that can serve as a steep but speedy shortcut on the way down. With the hillside slanting sharply down to the right, there are some limited views of the Meneka Peak (2,393’) behemoth across the valley. At 1.5 miles, the trail switchbacks left again then proceeds along a path that is sandy, even chalky. 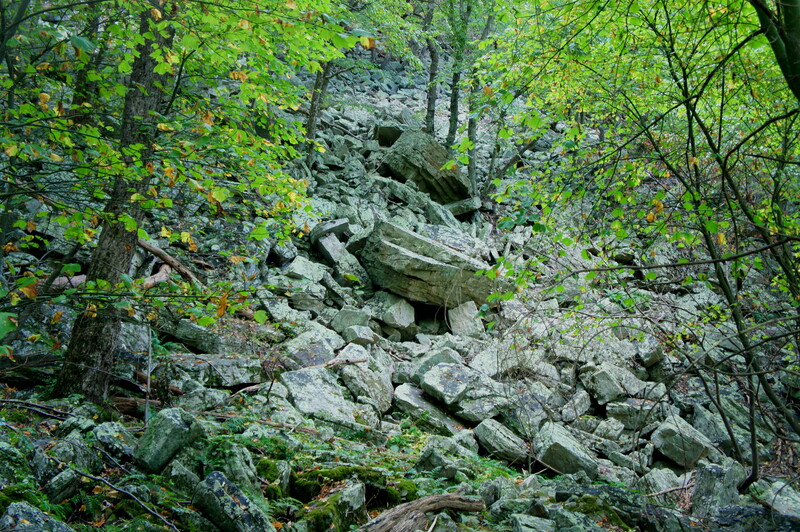 Beyond, hikers round a corner into a shady ravine and come within striking distance of a natural amphitheater in which tens of thousands of boulders have been deposited. At around 1.8 miles, the footpath crosses a minor rock slide on the left, then approaches the gargantuan rock depository again. From here the trail zigs and zags up the hillside, reinforced with sporadic sets of rocky steps. At 2.1 miles, hikers will cross the unmarked shortcut trail again then round a final, right-hand switchback. By 2.4 miles, you have reached the four-way trail junction at Shawl Gap, a worthy spot to take a break after the steady climb of nearly 1,000 feet. 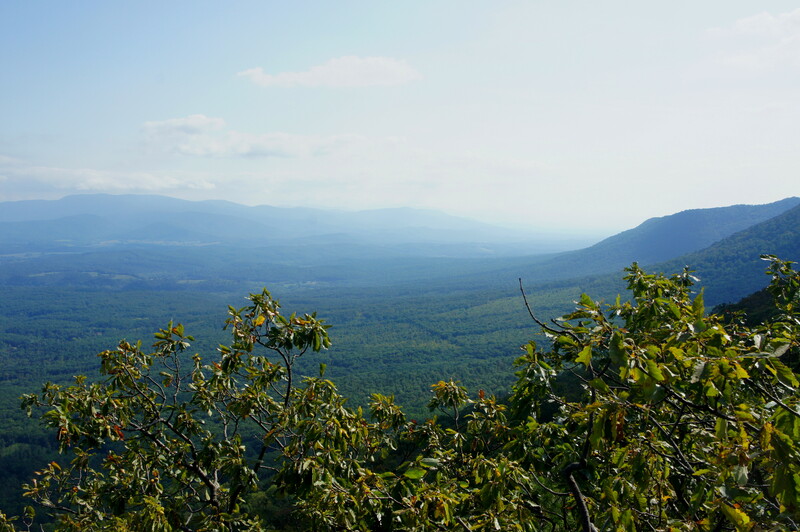 At Shawl Gap (~1,700’), leave the Massanutten/Tuscarora paths behind and turn left onto the white-blazed Buzzard Rock Trail. After an initial stretch of sandy flats, the hike eventually picks up elevation again as it heads northward toward the hike’s destination. Approaching 1,900 feet, look for an obvious spur trail on the left heading to a splendid campsite at about 2.8 miles. 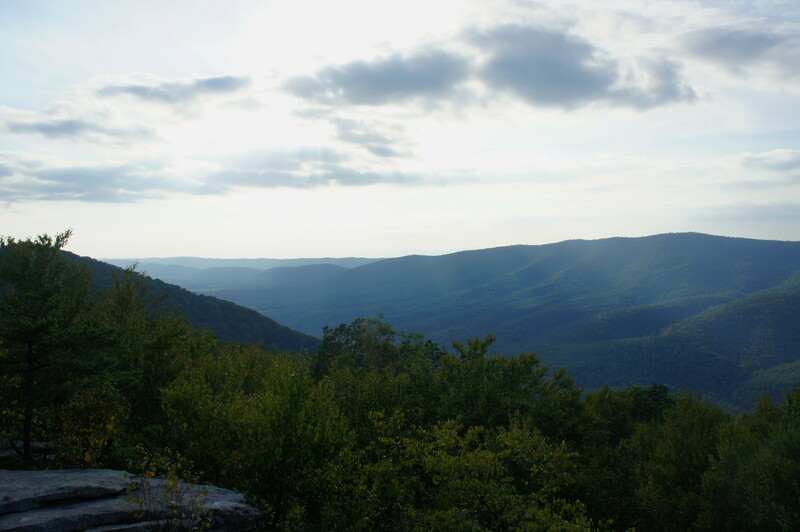 Walk through the campsite to a scenic perch identified on some maps as the “Elizabeth Furnace Overlook.” From this vantage point, hikers will enjoy splendid views of Fort Valley, High Peak, and Green Mountain, a scene that is particularly spectacular as dusk approaches. 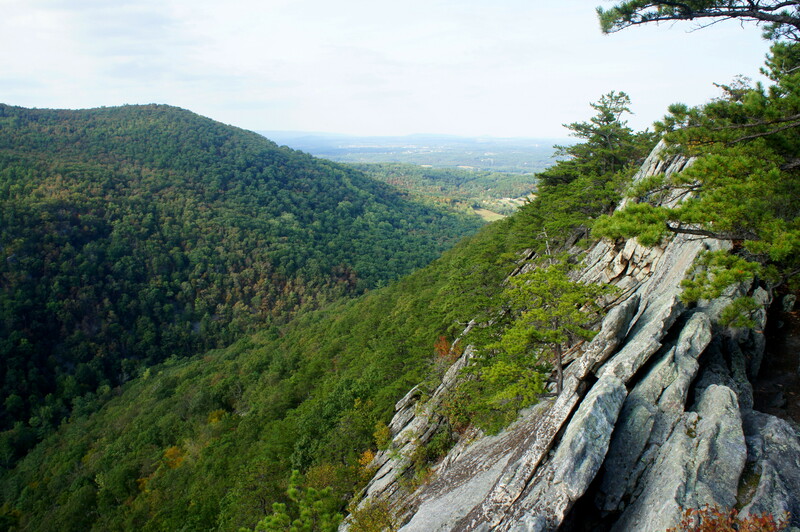 Returning to the main trail, continue north on the Buzzard Rock Trail, passing enticing rock outcrops on the right that nonetheless offer only obscured views to the east. Pay careful attention to follow the white blazes, as it is easy to lose the trail amid the rocky jumble. 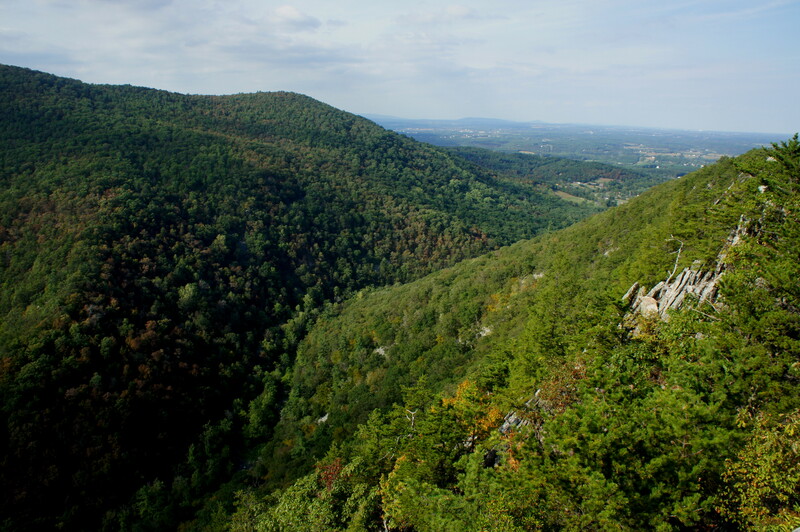 Trace the path as it straddles the ridgeline to a point at around 3.1 miles, where an unmarked social trail bears off to the right and down to a hidden gem: a spectacular, unobstructed viewpoint overlooking the Shenandoah Valley. 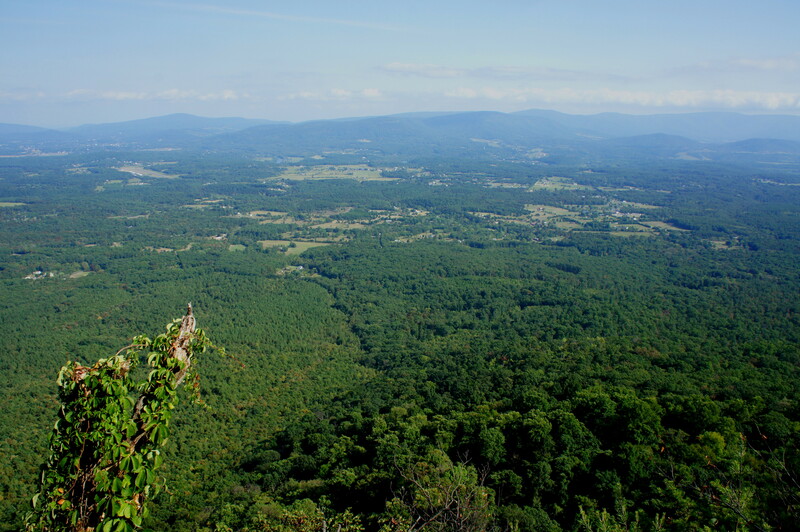 This is hands-down one of the best vistas in the area, as a sea of green unfolds below, bounded on the horizon by the Blue Ridge Mountains of Shenandoah National Park. The town of Front Royal is spotted due east, while the blue waters of the Shenandoah River snake through the valley. The Massanutten ridgeline—uninterrupted by development—continues for miles to the southwest. Back on the main trail, it’s time to start a steep descent. After passing under a stand of hemlocks, the trail snakes downhill, then drops sharply down the rocky ridge. 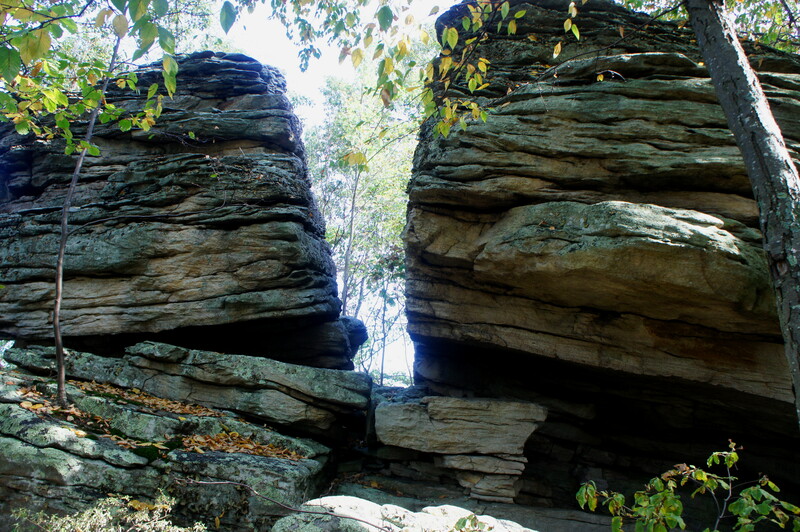 At 3.4 miles, the path briefly climbs to a point ruled by two gargantuan boulders. Then it’s downhill again, at one point switchbacking left, then right. Pass another campsite on the left at 3.9 miles, then proceed another 1/3 mile to the southern fringe of Buzzard Rock, where you are likely to encounter crowds on a nice, summer day. 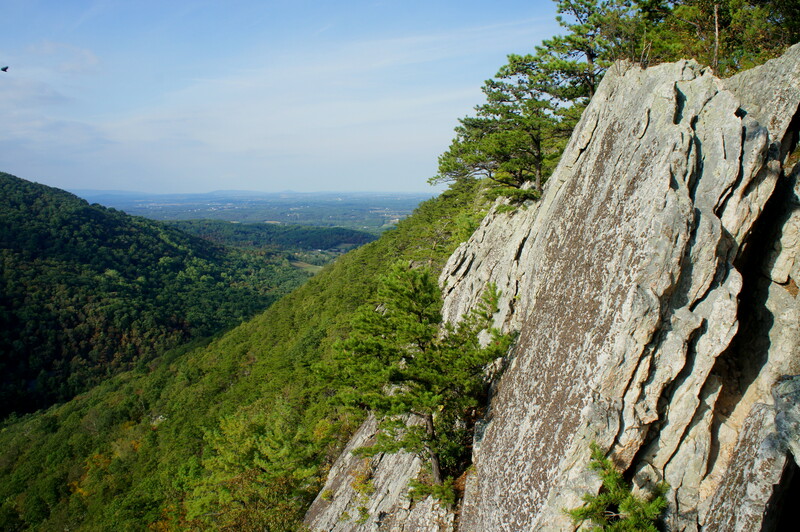 The hard Massanutten sandstone at Buzzard Rock has survived weathering while the softer, surrounding shale has not, leaving behind a thin but durable spine that reaches for the sky at a sharp angle. 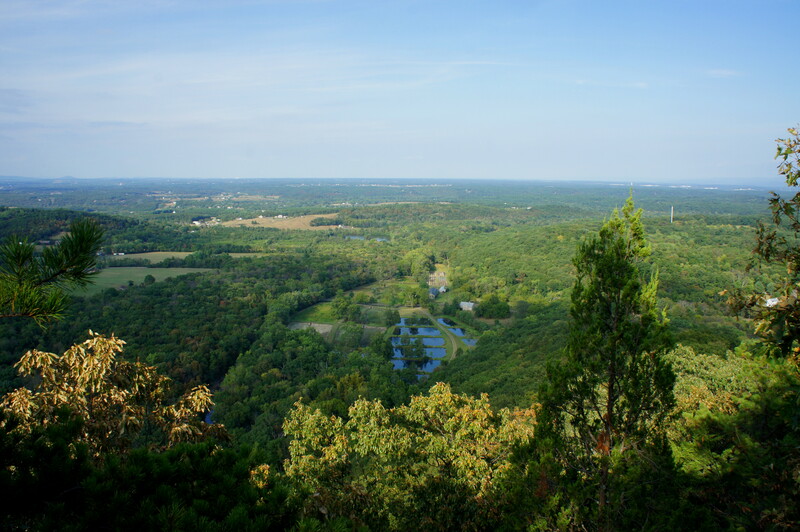 Gray to chalky white, the Buzzard cliffs are a favorite among local rock climbing enthusiasts and, for hikers and climbers alike, offer excellent views of Fort Valley and the narrow canyon carved by Passage Creek through Massanutten Mountain at Blue Hole. To the north, the mountain gives way to an open expanse dotted with small farmsteads. It goes without saying—be careful on the rocks, as there is little protecting you from a fall of 100+ feet. The rocky spine continues for about a quarter mile, leaving plenty of spots to sit down for lunch or a snack. 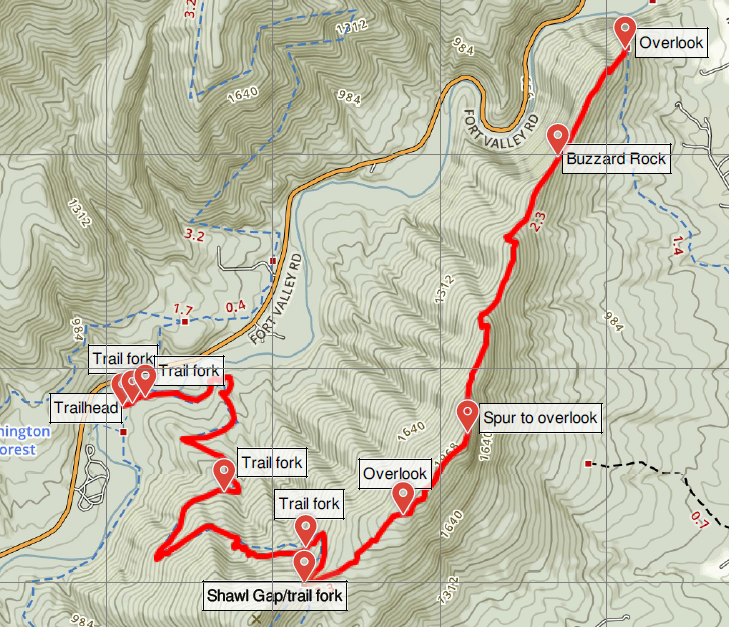 It’s 4.5 miles in total—with significant elevation changes—from Elizabeth Furnace Day-Use Area to Shawl Gap to Buzzard Rock and the final viewpoint. The return trip, which includes a steady, 1,000-foot climb back up the ridgeline en route to Shawl Gap, can be draining; however, once at Shawl Gap, the aforementioned shortcut trims at least a mile off the descent. To reach this route, head straight at Shawl Gap (toward High Peak), continue 25 yards, then head right on the unmarked path on the right. Because this yellow-blazed trail is unmaintained, hikers should expect to encounter loose rock and fallen logs; but the steep descent is over before you know it, crossing the Massanutten/Tuscarora Trail twice and ending at the Charcoal Trail near Elizabeth Furnace. Bear left, heading downhill to rejoin the Pig Iron Trail, picnic area, and parking lot. This entry was posted in George Washington National Forest, Strenuous Hikes, Virginia and tagged Buzzard Rock, Elizabeth Furnace, Fort Valley, George Washington National Forest, Massanutten Mountain, Massanutten Trail, Passage Creek, Pig Iron Trail, Shawl Gap, Shenandoah Valley, Tuscarora Trail, Virginia. Bookmark the permalink.